This is No. 7 in the series. Please read my introduction and explanation here. Apostolic succession. It’s what the Catholic Church cites as the reason for her claim to supreme authority in Christendom. Based on their reading of Matthew 16, Catholics believe Jesus conferred on the apostle Peter authority over his church as the first pope. 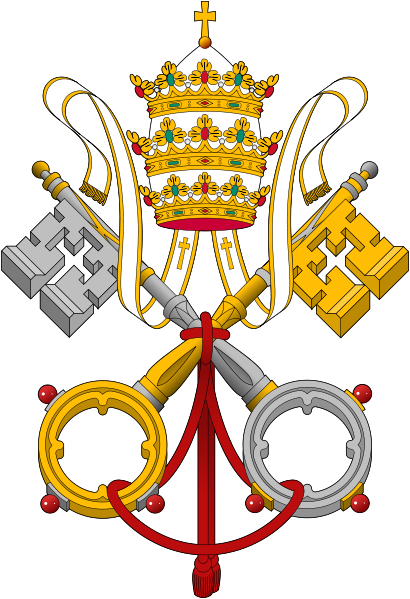 Following from that, there must always be a visible, authoritative figure over the church, which was realized in the continued line of bishops of Rome as succeeding popes. There are a number of reasons why I reject the claim of a Christ-established papacy. The first is that it is not taught or even suggested in the Bible. In Matthew 16, Jesus asks his disciples, “Who do people say that the Son of Man is (as if he didn’t know)?” They respond with the popular identifications…John the Baptist, Elijah, Jeremiah. Then he asks them, “But who do you say that I am?” And Simon Peter…impulsive, loyal, outspoken Peter answers immediately (you can almost picture him jumping up and down in his seat, his hand high in the air, murmuring, “Oooh, oooh. Pick me! Pick me!). “You are the Christ, the Son of the living God,” he replies. And since this was the exact answer Jesus was looking for, he rewarded Simon with a new name, Peter, which means rock, and told him, “On this rock I will build my church.” The Catholic Church interprets this as meaning that the church was founded on Peter as its first pope. I believe Jesus was recognizing Peter’s clear identification of him as Christ and God as that on which his church would be built. Notice the way Jesus sets this up. He gets them to voice the opinions of the general public as to his identity, who think he’s at most a prophet risen from the dead. But prophets were chosen by God for a reason – revealing his plan, his character, his judgment, and for a season – until they died. Not to be the ever-living foundation of his “called out” ones, his church on earth. When Jesus prompts his disciples, knowing Peter would be the first to respond, to profess their faith in him as the Messiah, he is contrasting their correct apprehension of his identity and mission with that of the unbelievers. And declares that his church will be built on this true faith. Nowhere in Scripture is there any mention of one of the apostles or bishops having supreme authority over the entire body of Christ. Jesus is the head and foundation and no one else. There were recognized leaders in Peter, John, and James. But no pope. A second reason is that giving any man such worldwide power and authority is likely to corrupt him and his supposed divine influence, and it has. The corrupt and immoral behavior of some of the Church’s popes is well-known. I just don’t believe Jesus would have instituted such an office unless it was absolutely necessary. Now, someone will say, then why are there divisions and conflicts among non-Catholic Christians about interpretations? And I would answer, because we each have things in our lives and our flesh that interfere with a totally clear connection with the Spirit of Christ. The fact that the Catholic Church seems to stand united on Scriptural understanding is only because the faithful agree to submit to their bishops’ interpretation. And finally, the Catholic Church’s claim to apostolic succession is what has allowed her to assert for herself power and authority far exceeding the humble roles assumed by the leaders of the New Testament church. It is what has fostered and supported the creation of a second source of supposed inspired apostolic teaching which she calls Tradition, with a capital T…and that rhymes with P…and that stands for…pope? That will be reason number 8. There you go again interpreting what Mathew said (btw as an apostle was there) the way you want to.There has been NO question by any historians about the giving the leadership of the new church to Peter. Thanks for taking the time to read and comment, Paul. God expects us to love him with our minds, and he gave us his word and his Spirit to help us understand it. I believe he wants us to read it for ourselves and interpret it as best we can, not let someone else read it for us and tell us what it says. Peter certainly did have a leadership position, but I don’t believe it had the scope and power that within a few centuries the Catholic Church would ascribe to him. Since your authority is supposed only the Bible I wonder where you got the idea that “And Simon Peter…impulsive, loyal, outspoken Peter answers immediately (you can almost picture him jumping up and down in his seat, his hand high in the air, murmuring, “Oooh, oooh. Pick me! Pick me! ).” It sounds like something straight from Hollywood, just like love affair between the young Moses and Pharaoh daughter in the movie “Ten Commandment”, nowhere mentioned in Scripture. The irony is you forgot the words spoken by Christ in verse 17 where He indicated Peter’s words in verse 16 came from the Father – they did not originate from Peter himself. To meet your agenda you also forgot to mention that to Peter alone (in Greek it is in second person singular) Christ gave the keys of the kingdom of heaven. The authority to bind and to loose, on the other hand, is also given to all apostles. The fact that keys symbolize authority is attested in the Bible (Isaiah 22:22, Rev 3:7). You worry that authority given to mere men will be corrupted and indeed there were horrible popes. Why God chose such sinful men to lead His Church? The reason is given in 1 Cor 1:27-29, if you care to read them. Understandably you reject Magisterium – you want yourself (and/or your pastor) to be the magisterium. Unfortunately Scripture warns us about private interpretation of prophecy (2 Peter 1:20). While Christ had poor relation with the Pharisees He still recognize their authority and told His listeners to listen to them (Mat 23:2). To His disciples He said whoever listens to them listens to Him (Luke 10:16). Conveniently you picked a verse that seems to support your belief – if you read verse 26 you should know what verse 27 means. You try to soften the impact of different interpretation among non-Catholic churches by writing “we each have things in our lives and our flesh that interfere with a totally clear connection with the Spirit of Christ”. What happens in reality those interpretations may contradict each other! Certainly the Holy Spirit is not the source of such contradictions! It must come from other sinister sources! You forget that Scripture says the church is pillar and ground of truth (1 Tim 3:15), not everybody who can read Bible! You ridicule tradition, yet scripture talks about tradition (Greek paradosis) that we must hold (2 Thes 2:15, 2 Thes 3:6).